In a skillet over medium-high heat add the water and the green beans. Bring the water to a boil then cover the skillet. Allow the green beans to steam for 4 to 5 minutes, then remove the cover and transfer the beans to a dish. Place to the side. In a large bowl, combine the cream of mushroom soup, chipotle pepper powder, and salt. Stir well to combine. Add the thawed green beans and 3/4 cup french fried onions. Stir well until fully combined. Pour the mix into a 1 1/2 quart baking dish. Spread the mix evenly. Bake the casserole for 30 minutes, then stir well and taste. Add additional salt and/or chipotle pepper powder to taste. Top the casserole with the remaining french fried onions and bake for an additional 5 minutes or until the french fried onions are lightly browned. Remove from oven and allow the green bean casserole to cool for 5 minutes. Serve. Instead of fresh green beans, you can opt for canned cut green beans. Use two 14.5 ounce cans, drained. 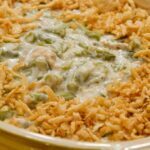 Adapted from French's original green bean casserole recipe.